If you will indulge us, we’d like to post this card retrospectively to complete our set from this expedition. As we prepare to return to UK, with our T-shirt tans fading, it’s hard to imagine that we spent 2 weeks in February, at our favourite Spanish campsite, Camping Sierra Espuña, in the Murcian village of El Berro. Despite the Siberian winds that had been blowing down over most of Europe, the almond blossom was still surviving when we arrived; pink and white varieties , with olive, orange and lemon trees filling the spaces in between. The Sierra Espuña national park is ideal for bird watching, serious hill-walking and cycling, (we left our bikes on the cycle rack), reading books, and doing nothing. If you just want to take short walks you can do local circuits of up to an hour and a half or less. What this site is best for is Peace. There is no ‘bling’ in El Berro. There are two baker shops. Until this Spring there was only one shop, Fina’s, now there are two. There are a couple of Cafes/Restaurants which take it in turn to open. The speciality of Cicileo’s baker shop is ‘empanadillos’: miniature pasties. The other Baker, David’s, is where you buy postage stamps! El Berro is the twistiest 14 Km ever from Alhama de Murcia. Don’t arrive in the dark! The site is terraced with the rear rank occupied by Spanish caravans that come alight on Friday nights. But they’re very friendly families so don’t worry. 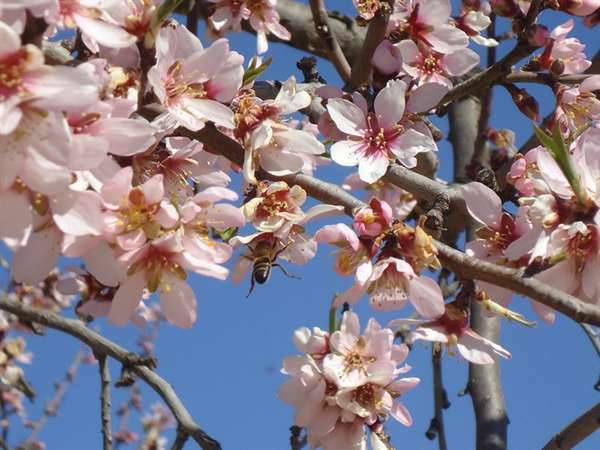 The rest of the week, the only sounds you will hear are the sound of the bees buzzing in the almond trees, and the tinkling of the bells as the sheep and goats forage in the groves. Once a fortnight or so, you may hear a sonic boom as Spanish Eurofighters streak across the blue sky past the mountain-top radar station. It’s over in seconds and peace resumes. The site offers low rates for stays over 7 nights, but in any event the charges are very reasonable. There’s free Wi-Fi around the bar, itself a little gem. The Staff now run the site as a consortium and they’re making changes to the site to accommodate larger ‘vans. The site has tennis courts and an open-air swimming pool. As elsewhere in Spain, this site is very busy in summer. It’s open all year so why not come here in low season. Hope you like the photos. We were here for the annual village song & dance fiesta: at the centre of the singing group is a 100 year old singing ribald lyrics to traditional tunes, to everyone’s apparent delight!